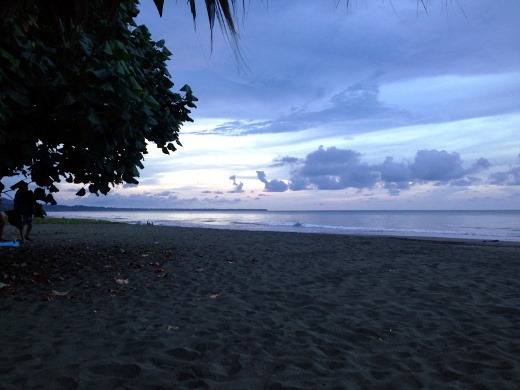 Today I thought I would share more photos with you from last month’s trip you Costa Rica. 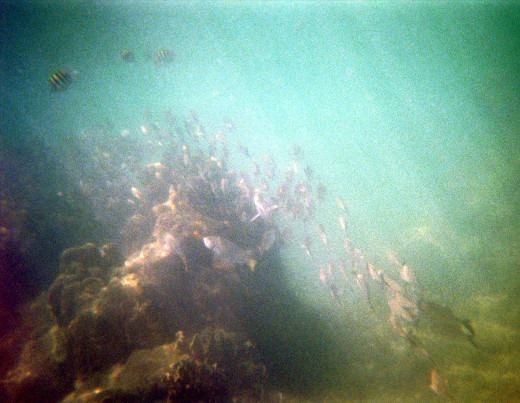 We finally had our underwater disposable camera developed and got the prints back a few days ago (a CD and hard copy prints for fun). It seriously took about three weeks to get them developed! It’s been a long time since I’ve used a disposable camera. I think my honeymoon was the last time! Apparently it is pretty ancient technology and our local drugstore had to send the camera away to get it developed for us. Without further ado, let’s get into Day 2 of our trip. After breakfast at our hotel, we were picked up by Gecko Trail Adventures for the tour we’d booked that day (I highly recommend this company, by the way), which was the Cahuita National Park visit, including a snorkeling excursion and guided rainforest hike. 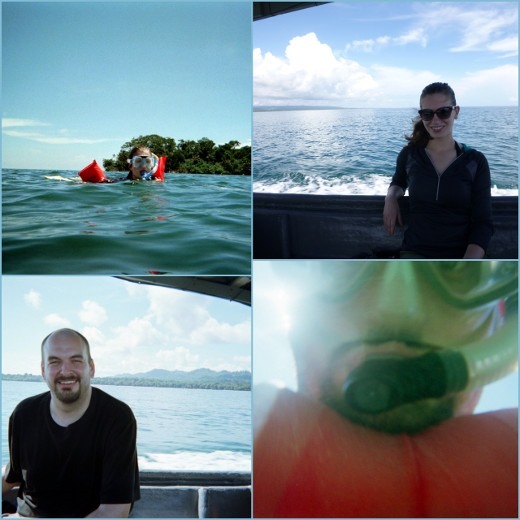 First, we went snorkeling. Our group was pretty small which was really nice – me, the huz, another couple from the US, and a solo traveler from Germany, along with our tour guide and boat captain. 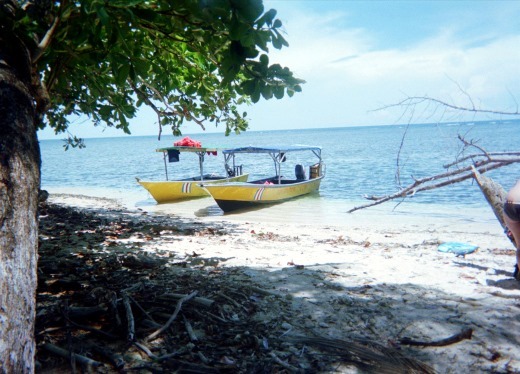 The seven of us headed out on a 20 minute boat ride in one of the above boats to our snorkel site. 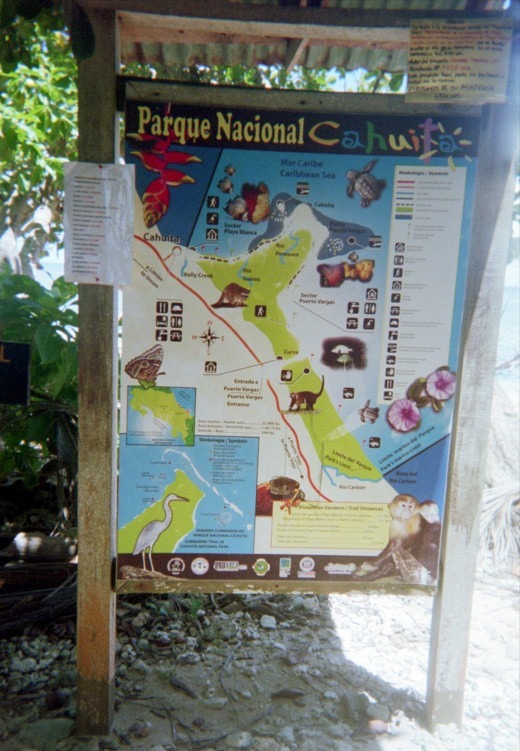 Cahuita National Park features the largest coral reefs in southern Central America, and we snorkeled at two different sites for 45 minutes each. This was really the first time I’ve legitimately snorkeled (I’m not counting messing around in 2 feet of water in Lake Michigan as a kid), and it was seriously one of the most fun things I’ve ever done! It was amazing and exceeded all expectations. 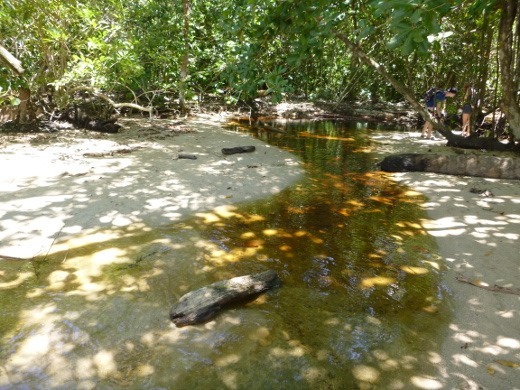 The water depth at the sites ranged between about 8 – 12 feet, and was calm, clear, and felt like warm bathwater. 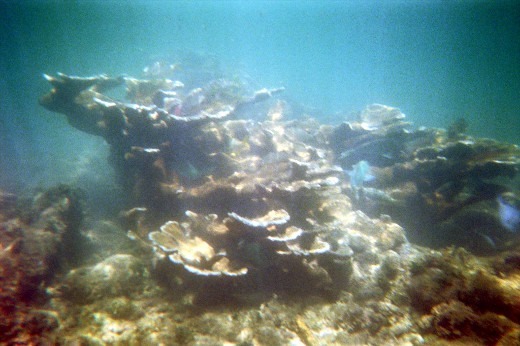 The first snorkel site was much better than the second site, but we only took our camera out with us at the second site, so the pictures aren’t that fantastic, but I’m super happy we snagged a few decent ones to help remember our visit. 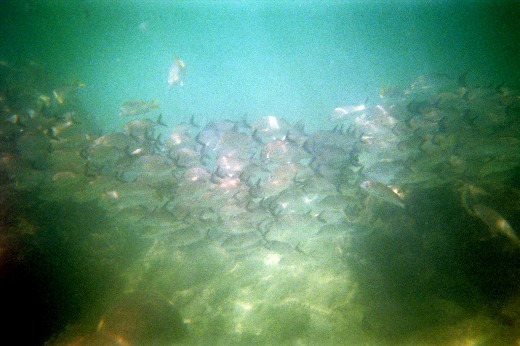 There were all sorts of colorful fish, sea creatures, and coral to see. After snorkeling, we boated over to a small beach and snacked on freshly cut pineapple (yeah, our tour guide just randomly carries around a machete specially for this purpose apparently) and trail mix. 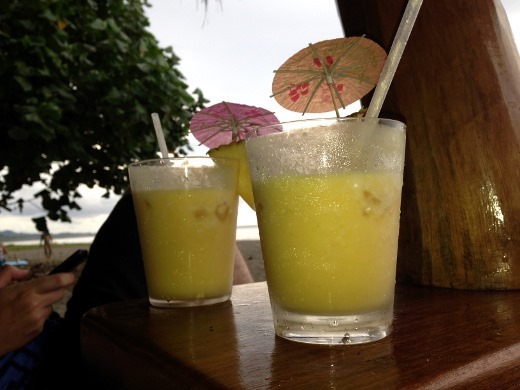 I ate fresh pineapple literally every day of our trip to Costa Rica (sometimes multiple times per day) – it was crazy good! 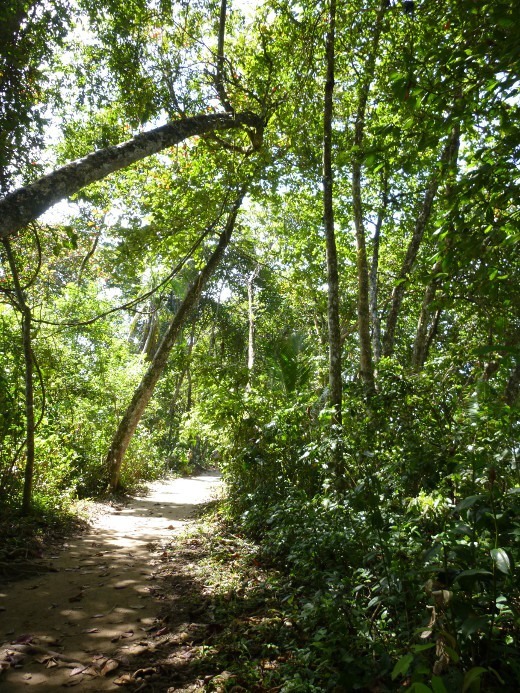 Next, it was time for our two hour hike at Cahuita National Park. 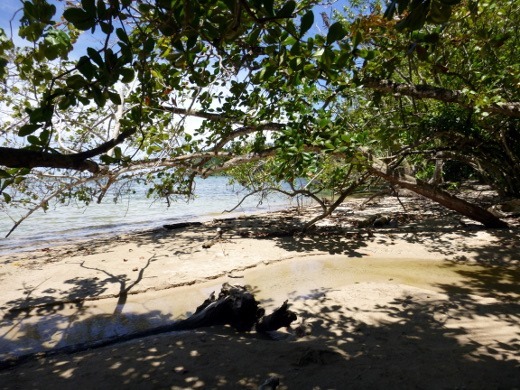 Much of our hike was also along the Caribbean coast, which made for some gorgeous scenery. 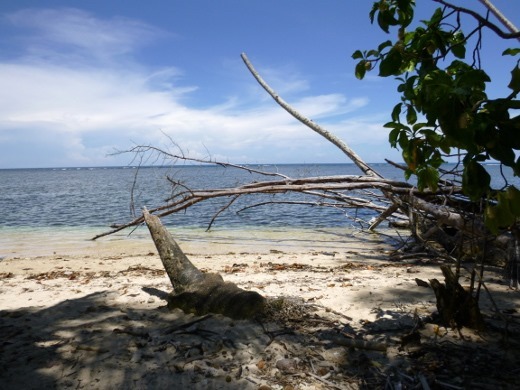 We were fortunate to visit on a perfect, hot, sunny day with temperatures in the mid-80s. My tennis shoes got wet from walking through the water at a few points during our hike. 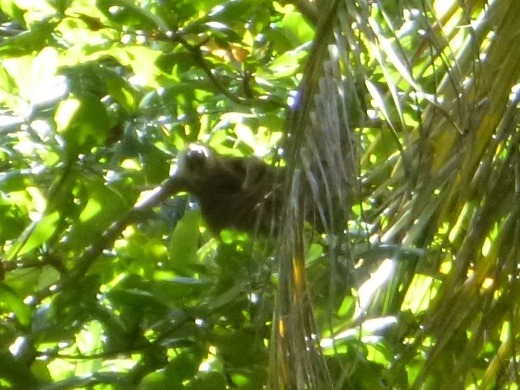 We also saw lots of wildlife during our rainforest hike, including a couple sloths! Here is a cute little two-fingered sloth hanging out. 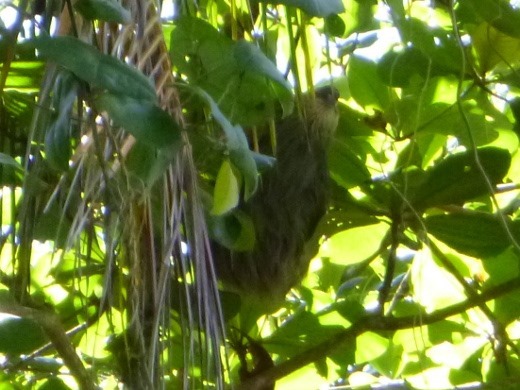 And another sloth, dangling a bit more precariously from the tree. These pictures from our rainforest hike with taken with my shockproof and waterproof rugged Panasonic Lumix camera that I bought for the trip (from Groupon) so they aren’t the greatest, but it was nice to not have to worry about damaging my nice camera during the more rugged excursions. 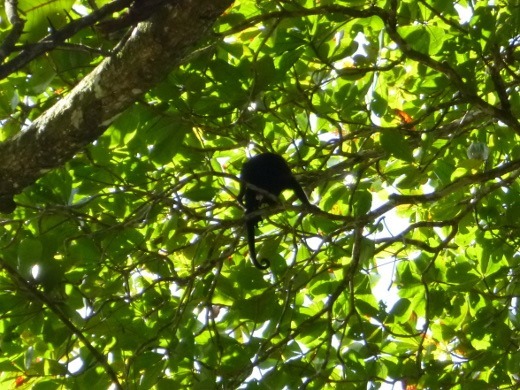 We also saw lots of howler monkeys jumping around the fruit trees! If you see fruit on the ground, look up and you’ll probably see a monkey! After our half day excursion we headed back to our hotel for lunch. 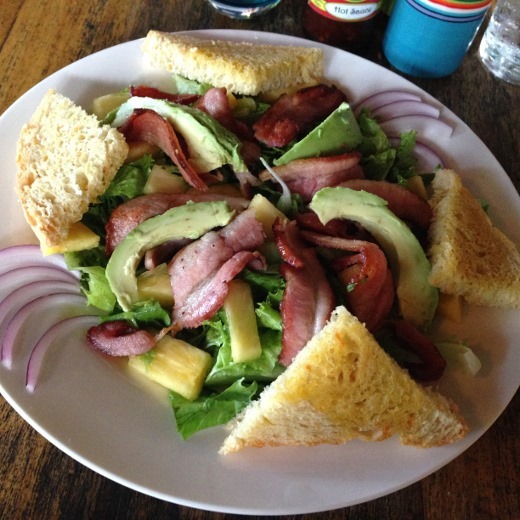 My favorite lunch at Banana Azul was the Tropical Salad with bacon, avocado, pineapple (yes, more! ), red onion, romaine, and basil vinaigrette. So fresh and tasty! Great combination of sweet and salty ingredients. 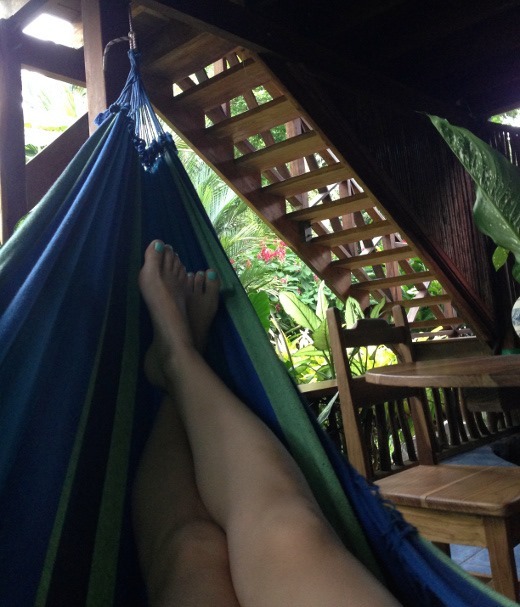 After a morning spent snorkeling and hiking through the humid rain forest, we spent the rest of our day engaging in some well-deserved lounging. I loved hanging out in the hammock on our private patio reading Game of Thrones! 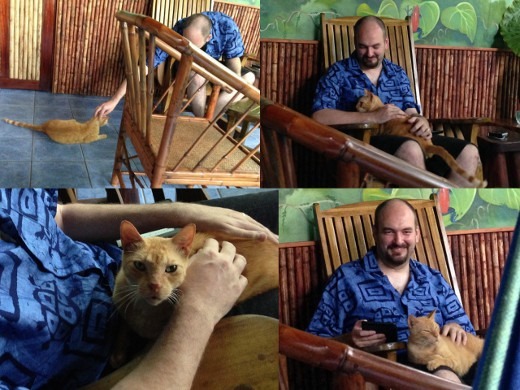 This orange cat came to visit us during our stay in the Red Frog suite several times and befriended the huz. She set up shop on his lap for the afternoon and just made herself comfortable. There are a few cats who live at the resort, but they are very unobtrusive and we enjoying seeing them hanging around during our stay. 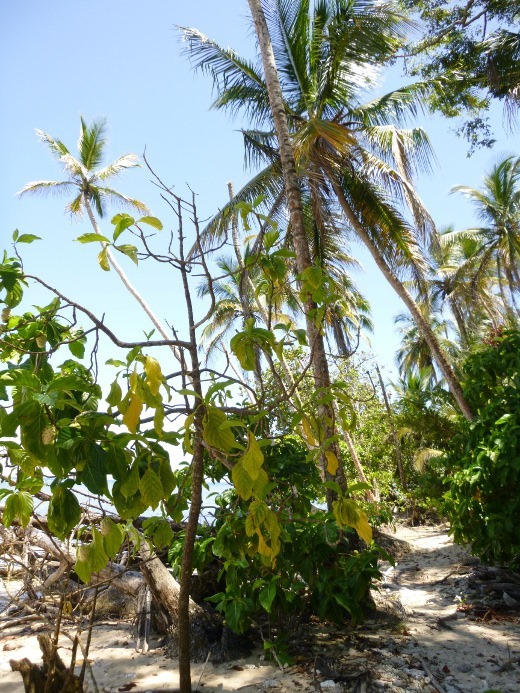 Later we moseyed on down to the beach for more lounging and for piña coladas with an ocean view. The hotel features a beach club with cocktail service on the beach, and you can bet we definitely took advantage of this. Later, we had dinner at the hotel. 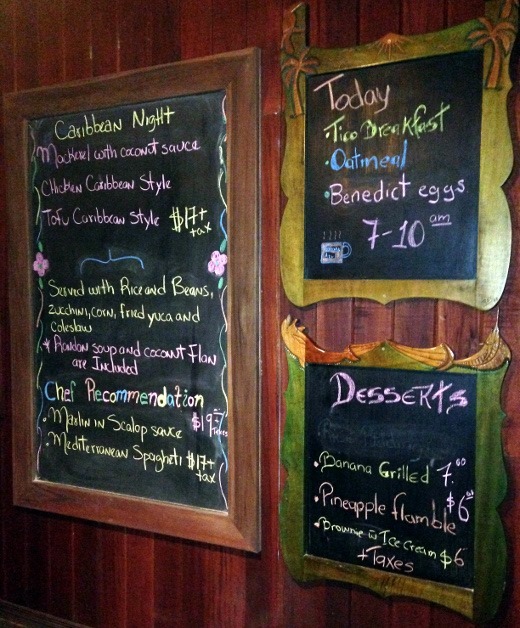 Each morning of our stay we found a sheet of paper under our door with that night’s dinner menu printed on it and we would anticipate dinner all day. 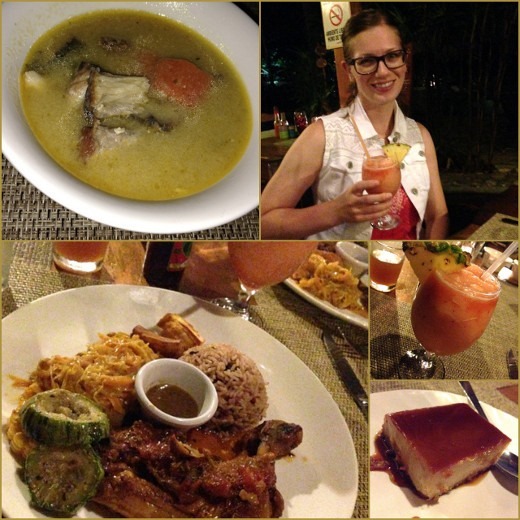 This particular day was Caribbean Night, which also ended up being our favorite dinner of our seven night stay at Banana Azul. Dinner came with rondon soup, a coconut curry soup with chunks of fish and veggies, which was absolutely delicious. I want the recipe. For our entrée, we both ordered the Caribbean Chicken, a tender, slow-cooked quarter chicken seasoned with lots of wonderful Caribbean spices and flavors, served with veggies, slaw, and beans and rice. Deeee-licious! Also rum punch because vacation. For dessert – coconut flan. Another fabulous day I’ll always remember! 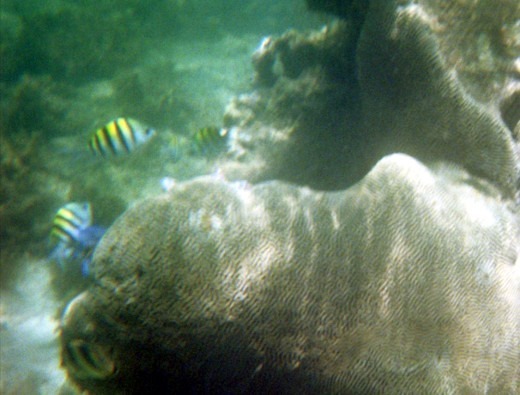 Snorkeling was unforgettable. 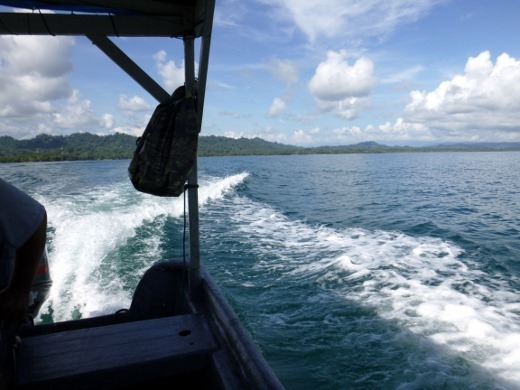 oh costa rica… I am coming. slowly but still, I am coming!